Vision accelerators are becoming an emerging solution to the increased processing demands in complex 3D scanning and inspection quality control applications. With a vision accelerator, customers have new approach to achieving higher performance, with little or no effort, when the built-in processing capabilities of smart sensors are unable to keep up. A smart vision accelerator, such as the LMI GoMax®comes in a compact industrial package with DIN rail mounting, consumes only 15W of power, and delivers over 1 TOPS (1 Trillion Tera Operations Per Second) of computing performance. One or more GoMaxunits can easily be used to build a solution to demanding inspection application, without need for multiple keyboard/monitor hookups, or the complexity of developing an application that works across several industrial PCs. The LMI GoMax smart vision accelerator is designed around a distributed, peer-to-peer networking concept that shares the data processing load between an LMI Gocator® sensor and a dedicated multi-GPU processor. When the vision accelerator connects with a smart sensor, the sensor is put into an accelerated mode where pre-processed, semi-compressed 3D scan data is sent over Gigabit Ethernet for final processing. This minimizes network bandwidth and drives faster cycles times by leveraging multi-GPU cores to do the heavy 3D point cloud assembly and measurement. With traditional sensors problems can arise when the demands of 3D processing are placed on an industrial PC that is running the main inspection application (user interface, visualization, reporting, and communication to other network devices) where the performance of the application can be compromised. Trying to accelerate inspection using this technique can use up too much of an industrial PCs resources and drag-down the system overall performance. With dedicated, multi-core data processing, a smart vision accelerator can handle continuous 3D data feeds over Ethernet. 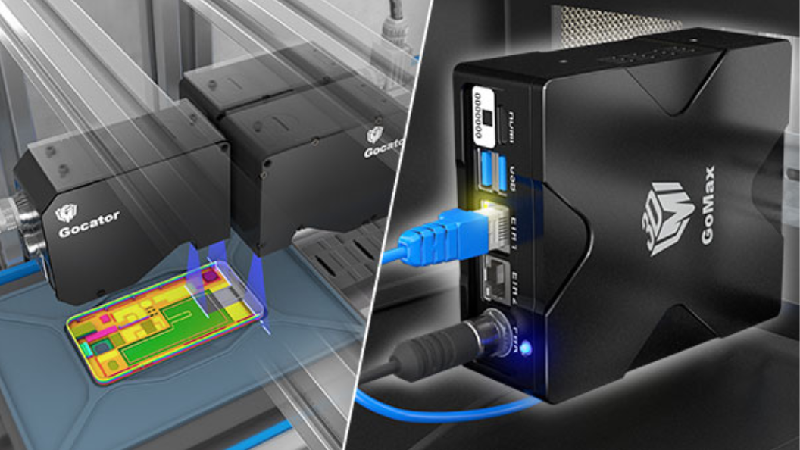 In contrast, the demands on managing a continuous Gigabit data stream from a single or multi-sensor connection may jeopardize the performance of the main inspection application running on an industrial PC, by consuming too much CPU or memory resources. A smart vision accelerator is able to automatically recover from inspection errors and system failures using a built-in watchdog. Industrial PC’s typically run generic operating software such as Microsoft Windows, where there is no watchdog to detect a hung application and subsequently recover. Finally, a smart accelerator is designed for easy upgrade or customization through a single firmware download that reflashes both the operating system and the inspection application. Industrial PC’s are not designed to upgrade operating software or application components using over-the-wire methods.